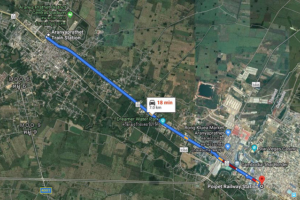 Thailand’s Ministry of Transport is set to reopen services on the Aranyaprathet – Poi Pet railway connecting Thailand’s and Cambodia’s rail networks. 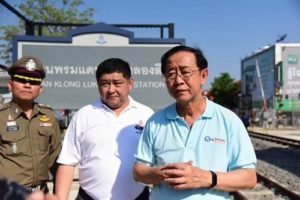 Thailand’s Minister of Transport, Arkhom Termpittayapaisith, led a team of ministerial executives to follow up on the construction and facilities management at Ban Khlong Luek Border Crossing Temporary Railway Station in the Aranyaprathet district of Sa Kaeo, and checked the tracks in preparation for the reopening of Aranyaprathet – Poi Pet railway service on 22 April 2019. Services on the Aranyaprathet – Poi Pet railway have been suspended since 1965. The State Railway of Thailand (SRT) has renovated the line by improving its structural integrity, changing railway sleepers, rails, braces, junctions and replacing the ballast. The reopening of the Aranyaprathet – Poi Pet railway will help improve the convenience and speed of both passenger and cargo transport between Thailand and Cambodia, enhancing ties in the ASEAN community and promoting tourism between both sides.